Interior designer Abbie Naber's California home takes indoor-outdoor living to the next level. There are cool dining rooms, and then… there’s Abbie Naber’s dining room. 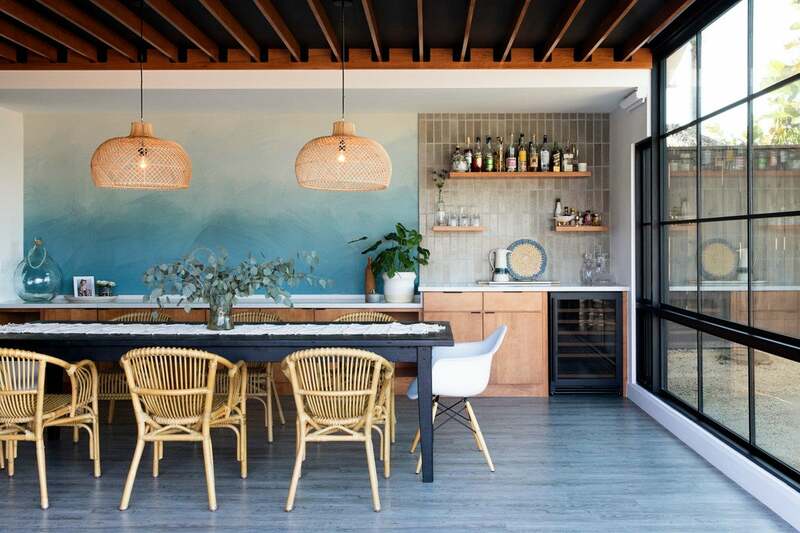 With all the essential makings of an incredibly chic dining space (think, ombre wallpaper, floating shelves, and rattan chairs), the picture-perfect room effectively captures the indoor-outdoor zen that permeates the rest of the interior designer’s recently-renovated San Diego abode. A certified textile junkie and self-professed design mut (her style spans from mid-century modern to global, eclectic), Naber had originally moved to California to pursue a career in fashion design. It was this same passion for pattern and creative energy that would eventually inspire the Seattle-native to kickstart her own business, a.NABERDESIGN, years later. To say that this project was a labor of love would be an understatement. While the couple—who closed on the home on their wedding day and started demolition the following week—made very little changes to the existing structure during the first phase of the renovation, most recently, the duo expanded the home to make room for a larger indoor-outdoor dining space off the living room. “I think that people have this stigma of a dining space being really formal and stuffy and unapproachable, and it’s not that at all,” Naber says of the finished space. In order to create the effect that the new addition was, in fact, a seamless extension of the existing structure, the couple opted to raise the roof and add wood slats to the ceiling to visually tie the space together. Woven textures, organic tones, and seemingly handmade touches (can you believe that ombre blue mural is actually wallpaper!) complete the casual-chic scene. A curated gathering of, well, a little bit of everything, Scandinavian splashes, mid-century moments, and bits of bohemian peacefully collide around every corner. Largely inspired by her travels—and big-name designers like Sarah Sherman Samuel and Leanne Ford—Naber doesn’t adhere to a singular aesthetic, and that’s alright by her. “I would call myself a mut in terms of what I’m made up of. I love mid-century—I think that’s where everything started for me. But I’ve fused in other things to kind of break that up. I like decorating with vintage and items I’ve picked up at the flea market or from our travels. I just don’t love doing one thing one-hundred-percent,” she explains. Unable to shake her fashion roots, Naber also sells one-of-a-kind throw pillows and blankets through her online shop. “It’s kind of a side passion of mine that I can’t quite quit. I think it probably from learning a lot about textiles in school,” she says. Going beyond plush throw pillows, her eye for pattern translates to almost every surface in the home—from the bathroom floor to the backyard patio. “I think I’m definitely a designer that’s drawn to tile and wallpaper. It’s a starting point for me. It’s easier to start with a pattern and work out from there versus finding all your big pieces and then trying to find a pattern that works,” explains the designer. Knowing that the graphic tile she had selected for the master bathroom would bring a sense of business to the space, the designer pared down the overall look and palette of the room, opting for a simple mid-century-inspired vanity and sleek vertical subway tiles. In her daughter’s nursery, Naber wanted to avoid cliches by taking a more contemporary approach with the Scandinavian-style crib and moody, metallic wallpaper. During the same time that the couple decided to expand the dining room, they also added a tiled outdoor patio and ultra-chic fire pit zone. Stylish and, more importantly, low-maintenance, her Palm Springs-inspired yard is a stunning reminder to never underestimate a grass-free landscape. As for what’s inspiring her right now? Rustic-meets-minimalist spaces with a European edge, terracotta, mustard, and rust make today’s list of current obsessions. Though, it’s anyone’s guess what tomorrow brings.